Hello and welcome to Day 2 of our November Digital Stamp Release Showcase! Glad to see that you have dropped back by for Day 2. The creations made by the DT team have been very inspiring, alot of wonderful ideas. I love looking at other peoples ideas it helps get the ideas going in your head. After looking I just put the ideas into my memory bank. They stick in there somewhere then when I need a good idea they just kinda pop out. I can visualize the idea I want which helps, alot of people tell me that they can't see the idea in their mind. To me that's weird , I guess cause I can visualize exactly what I want. The card below was an exception to that rule. I colored the image with no particular card stock or patterned paper in mind, so when I went to put it together I had no paper with purple and orange pattern in it. Then I wasn't really sure that the colors actually went together. But I think I pulled it off, it turned out pretty good. I had to add the pink, cause the purple and orange together just didn't totally work. But I rather like this card, it's bright and cheerful. Everyone needs to get one of those kind of cards every once in a while don't you think. 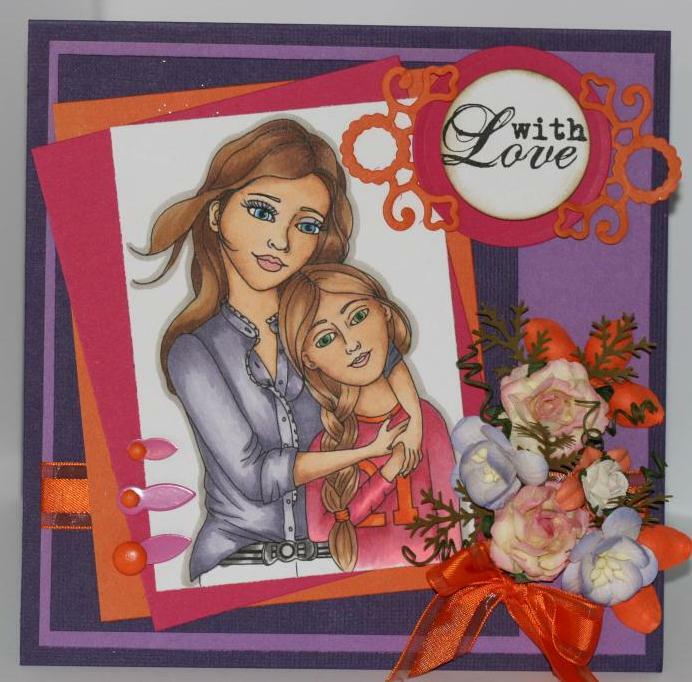 This card is made with an image called Sisters from Dana's Digis from Whimsy Stamps I loved working with this image. A close up of the colored image , colored with copic markers. 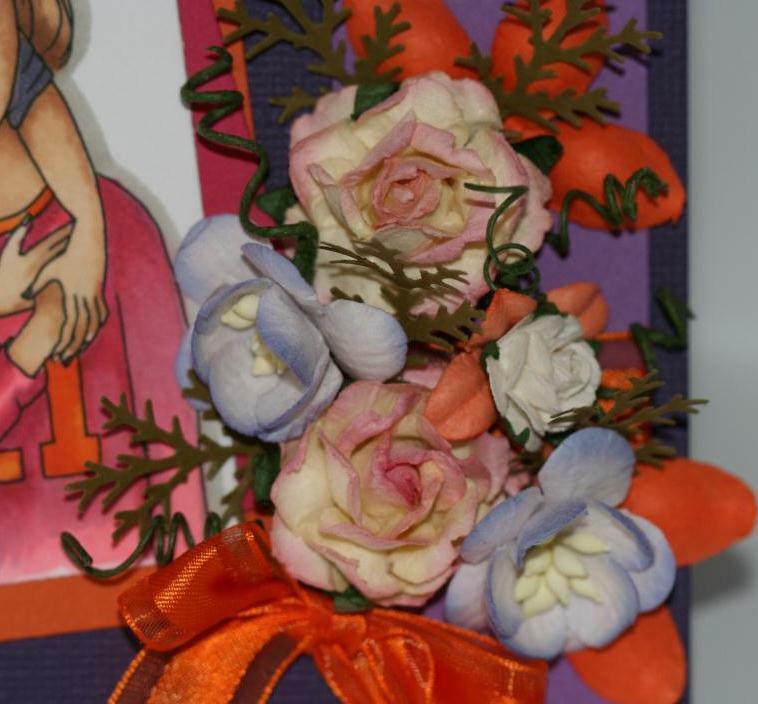 The flowers are from Whimsy and wild orchid. Supplies: Sisters image, Film Strip sentiments and flowers from Whimsy, Spellbinder Ironwork Accents and circles, Flowers from Wild Orchid, miscellaneous metal embellishments, Martha Stewart branch punch, ribbon. Stop by for more hopefully inspiring projects for you to be inspired by. I have 1 more release card, hope to see you soon. This is so beautiful, I love it, great job friend, amazing, sure has that Wow factor! 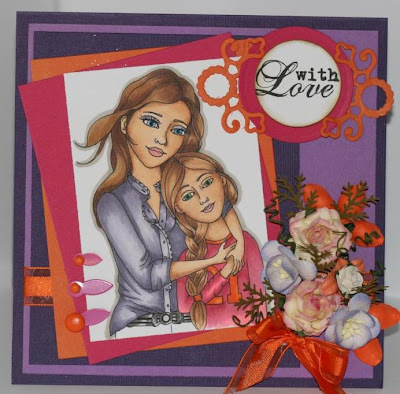 Beautiful card!! I think your colors are fantastic together! And such a cute image to work with! 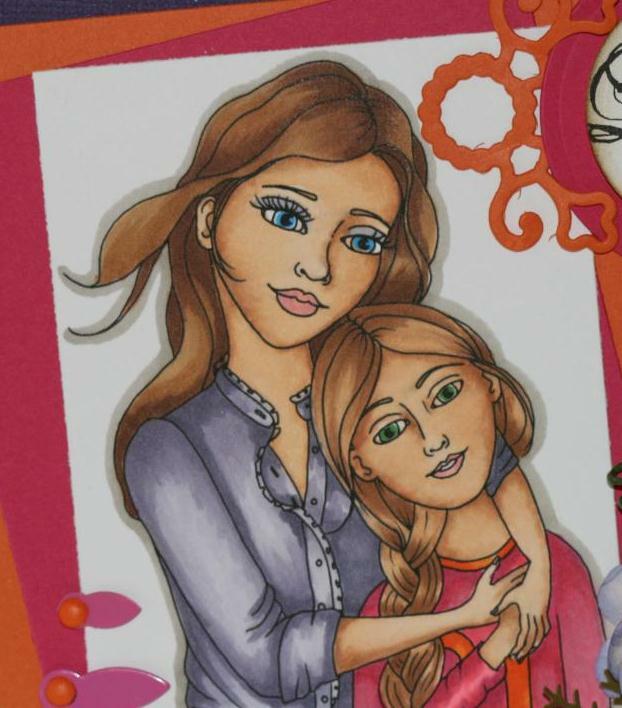 LOVE your sisters card! The pink does add a nice touch!